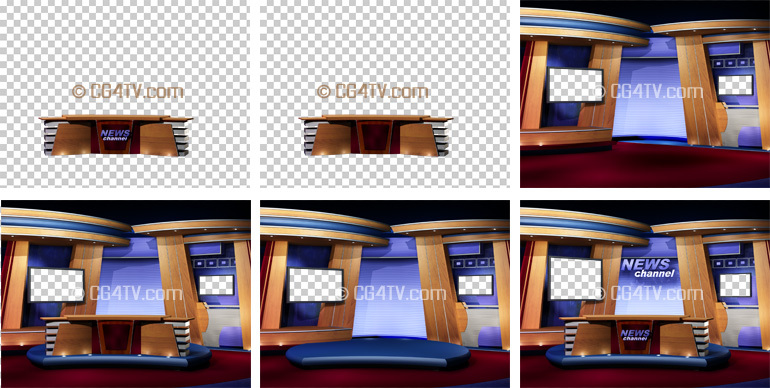 Our Royalty-free News studio background offers you amazing versatility with 9 camera angles and multi-layering for each. EXCLUSIVE product. 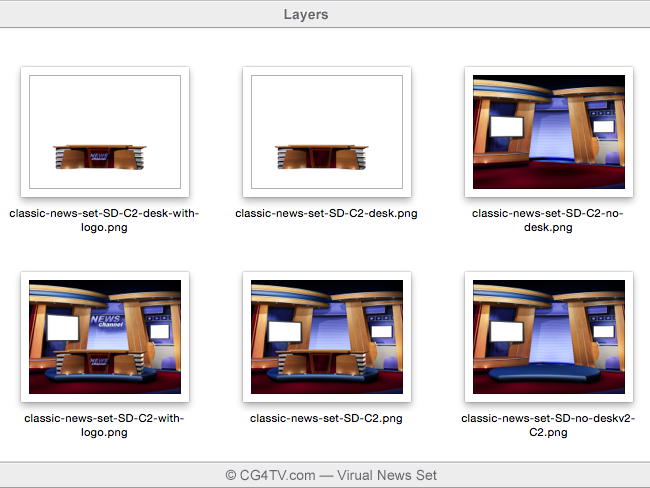 Classic Virtual News Set is only available from CG4TV.com. We don't have resellers. This product that can not be purchased elsewhere. Download Camera 6 (with a watermark) to check our set with your video editing software including Adobe After Effects, Final Cut Pro, Sony Vegas, Tricaster, etc. You program will look very professional with animated lower thirds. 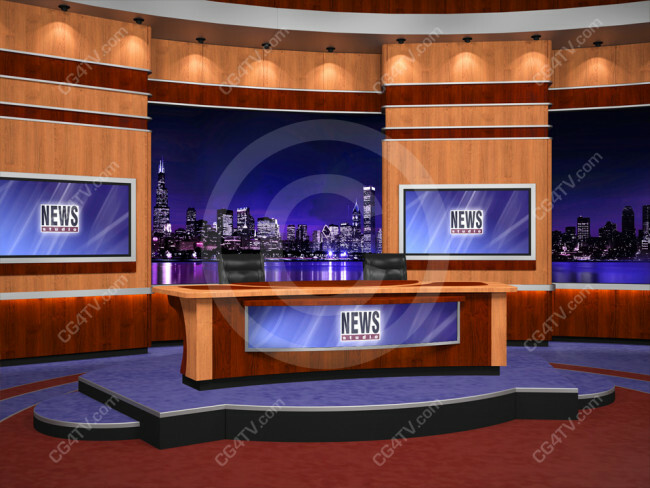 We include the 3D Animated Classic News Lower Third free of charge, designed specifically for this virtual news studio background. Animated Lower Third is available only with this product. Note: The single camera angles which you can purchase separately do not include this lower third. This news studio designed for one anchor and may be used with or without a table. You can also use it with a real desk. 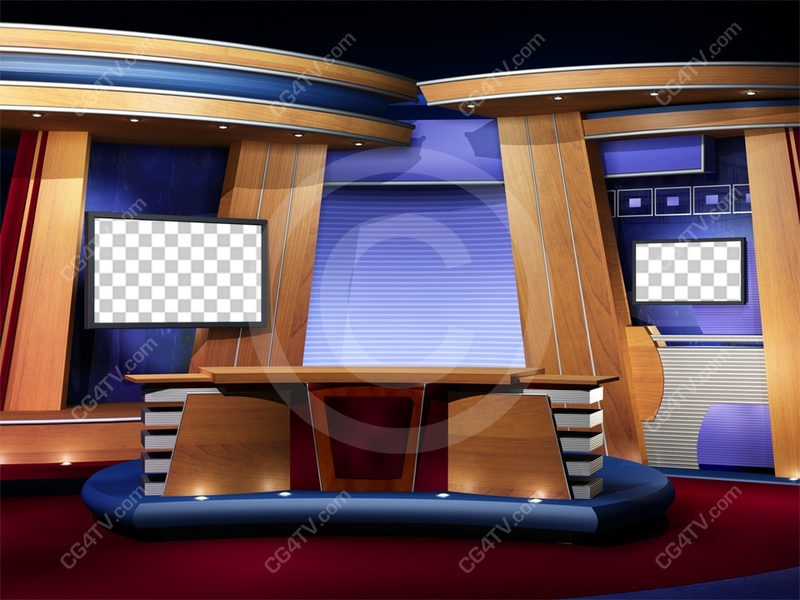 Wood paneling for this news studio background was created in the style of a large news channel. Two screens are located at the edges of the news background. Dark red carpet covers the entire floor. There is a table with the logo located on the curved blue stand. Background behind anchor is made in neutral blue and white stripes. We have included options for background with and without the logo. Many artists tried to copy this news background, but none of them can compare in quality to the original. 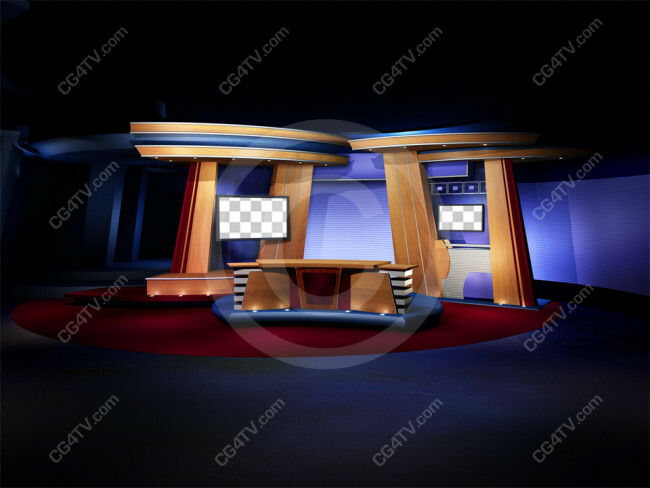 This Virtual News Studio background offers you amazing versatility. With 9 camera angles and multi-layering for each, you can configure this realistic set to suit just about any requirement. This Virtual news background is of such high quality that it has been used by HBO and in the TV show, Arrested Development, by Fox. 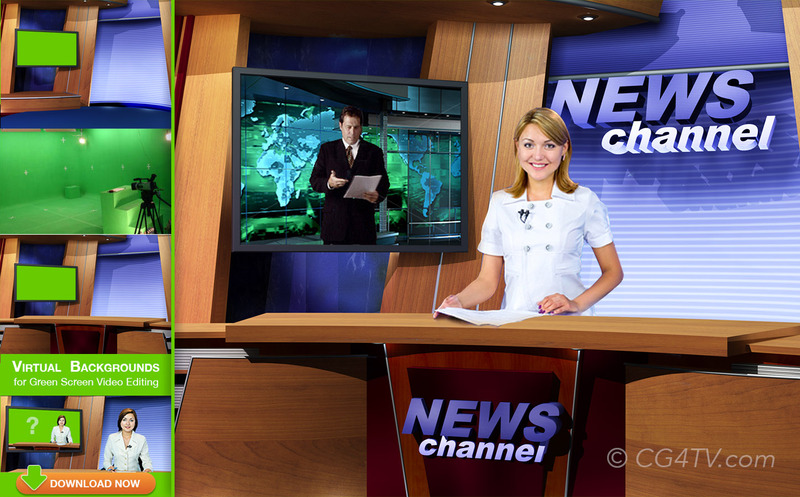 With this news background, you can focus on the news anchor from a variety of distances and angles. Or you can zoom in on the screen. Multi-layering of each camera view adds even more flexibility. 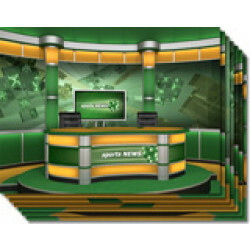 And with our experience in integrating our news studios into popular vr set systems, no matter what you use – green screen, blue screen or chroma key – our, our sets will fit your virtual production needs. Deliverables are in high resolution .png format providing ample room to pan and zoom to set up your shot. News background features inviting blue and maroon colors, with warm wood accents. You can use the stock version of our Classic Backdrop or we can customize one for you. 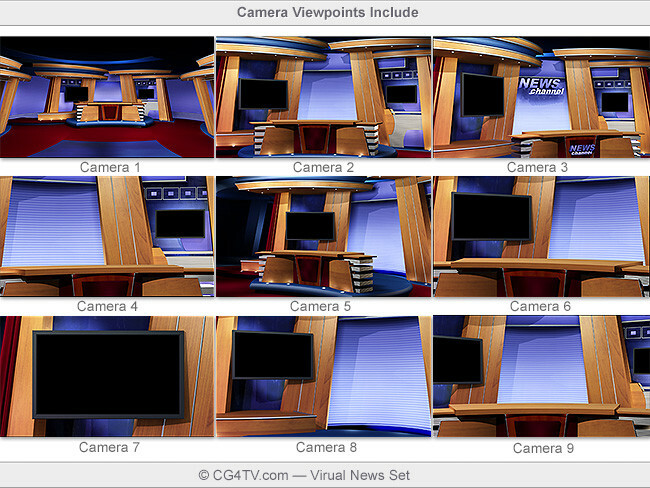 Or we can create an entirely new news studio to meet your needs. All virtual studios are compatible with any professional video editing software, MAC or PC. And you can download a free test before you buy. That way, you can test your concept ahead of time and there’ll be no guesswork. 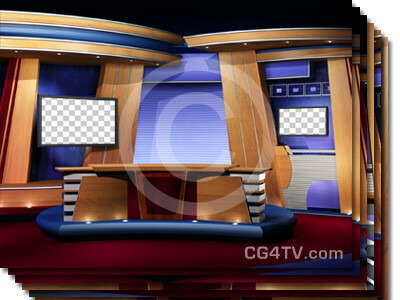 Our News studio backgrounds are only available from CG4TV.com. There are no resellers, so order your virtual news studio directly from us. 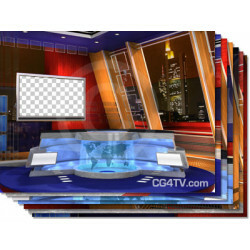 All of the images and virtual sets here at CG4TV.com are available in a variety of sizes and resolutions to suit a broad range of requirements.